A dozen of the 44 U.S. error coins stolen from an Indiana motel room in 2001 have been recovered and returned to their delighted owner through the joint efforts of three Professional Numismatists Guild members. At the time of the theft eight years ago these coins were to be the foundation of a planned book about off-metal errors. The recovered coins belong to collector and researcher Mark Lighterman of Sanford, Florida. They include what is believed to be the only known Walking Liberty half dollar struck on a planchet intended for five-cent pieces; one of three known Standing Liberty quarter dollars struck on a one-cent planchet; a unique 1858 Flying Eagle cent on a silver half-dime planchet; and a double denomination Indian cent on a previously-struck Barber dime. There is also a transitional error 1944-dated Washington quarter on a zinc planchet intended for 1943 cents. The coins were stolen along with a camera, laptop computer and a collection of over 1,000 casino gaming chips from Lighterman’s motel room in Southport, Indiana when he was traveling to the Central States Numismatic Society convention in Indianapolis in April 2001. 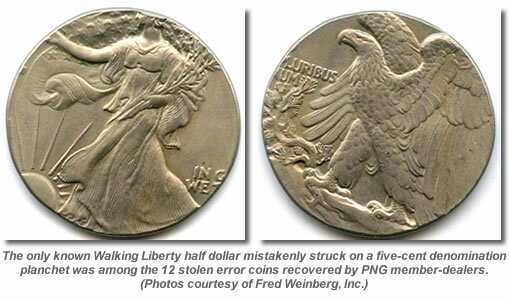 The recovery was made by PNG member Paul Nugget of Spectrum East in East Meadow, New York; PNG associate member Andrew Glassman, President of Spectrum Numismatics International in Irvine, California; and PNG Board Member and former PNG President Fred Weinberg of Fred Weinberg, Inc. in Encino, California. Ironically, Lighterman was told by Weinberg about the unexpected recovery just a few hours after he went to the bank to look at his remaining off-metal error coins for the first time since the theft. "I was in total shock because I had not touched the wrong planchet collection in eight years, and that same day I got the phone call that a dozen of the coins had been recovered. After all these years I thought they were in a river somewhere because nothing had ever surfaced from the theft except for my Nikon camera that showed up in a pawn shop in Ohio and some obsolete casino chips someone tried to cash in at a Florida casino," said Lighterman. "Now they’re going back into my collection. These are the keys to the collection and the book I’m working on with Dave Camire about wrong planchet errors." The recovery began when Nugget was contacted in late-August by a Georgia client who wanted to sell a large group of coins and paper money. "The group included error coins that my client purchased in an estate sale about five years ago. With his permission I wanted to show them to several error coin experts, and I contacted Fred first," Nugget explained. "As I opened the package sent by Paul I immediately knew these were unusual and rare error coins, but there was no writing or other notations on the coins’ holders to indicate any pedigree or source," said Weinberg. "When I began researching them I realized that 12 of the 13 error coins submitted by Paul’s client matched the descriptions of coins taken in the 2001 theft. It’s mind boggling how these showed up after all those years. It’s very gratifying, too, because once we all realized these were stolen there was never a moment’s hesitation by Paul’s client or anyone else about immediately getting them back to Mark." 1944-S Washington quarter on a 1943 type zinc cent planchet, one of only two known. Lighterman says he never filed an insurance claim or sought a tax write-off for the 2001 theft. "The only insurance I could have claimed the loss against was my homeowner’s insurance. But at the time, after Hurricane Andrew, homeowner’s insurance was almost impossible to obtain in South Florida where I was living at the time. So, after discussing it with my accountant and others, I didn’t file a claim because I didn’t want to take a chance on my insurance policy being canceled and then being unable to get another company to insure my property," explained Lighterman. "I am so happy get these 12 coins back after all this time, and I thank Paul Nugget and his client, and Fred Weinberg and Andrew Glassman for their help and support." Founded in 1953, the Professional Numismatists Guild is a nonprofit organization composed of many of the country’s top rare coin and paper money dealers who must adhere to a strict Code of Ethics in the buying and selling of numismatic merchandise. The Guild’s motto is "Knowledge, Integrity, Responsibility." For additional information, visit online at www.PNGdealers.com. So glad these rare treasures finally re-united with their rightful owner. Those are truly some amazing error coins. I bet the book will be fascinating reading!